This tour sounds great on paper but when you actually check it out, atleast on this particular night, you realize how different the 3 artists on the bill truly are and I’ll start at the beginning with DJ Starscream. 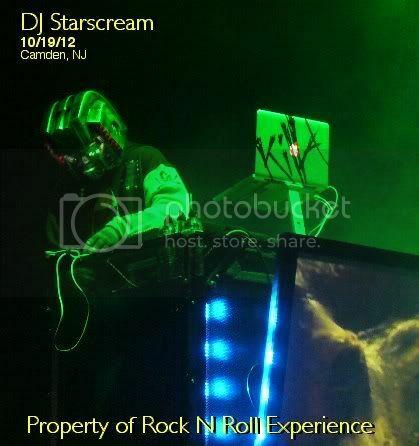 Starscream is one of the guys from Slipknot that no one really knows nor cares about, he’s a DJ & let’s face facts here, the main members of Slipknot are Corey Taylor, Clown, & Joey Jordison while the others drift into obscurity on many levels with the ones in the back that sample & DJ being almost totally unknown on most levels. The Starscream’s set was good for what it was....he brought a techno dance show to a large rock arena & the thing you have to realize is that this was a ROCK crowd, they wanted to see live rock n roll, NOT a DJ set. Sadly, what I saw while Starscream did his thing was a crowd of rockers browsing facebook on their mobile devices & the other half were zoning out or yawning. Starscream took the stage under heavy fog, his mask looked like a Transformer robot & his roadies tossed out shirts & cd’s randomly through the set....I’m assuming the free shirts & cd’s were a way to keep the audience awake since most were not really paying attention to this part of the show. When Starscream’s set ended you could hear a collective sigh throughout the crowd because like I said, his DJing was good, this just was not the right environment for beats, noise & nonstop sampling.....you can’t place a rave in the middle of a mosh pit and expect it to translate well! Marilyn Manson took the stage just after 8 PM and I had high hopes for a strong set from MM considering the show I’d seen from him earlier this year at the Fillmore in Maryland was actually quite good & more or less a return to old school MM. 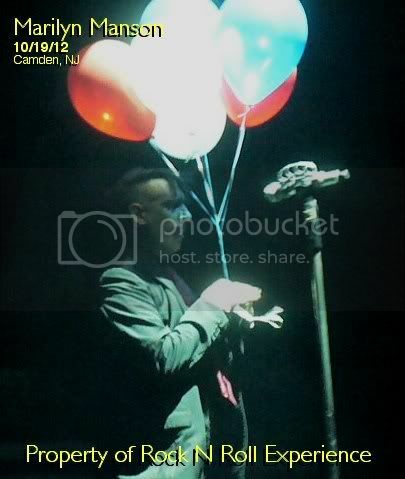 Sadly, the show MM brought to Camden, New Jersey this night was loose, full of flubs and it was almost a crime to charge a cover to witness the sloppiness that was MM this night. Manson’s vocals made Vince Neil from Motley Crue’s vocals sound amazing and the reason for that is simply because MM was rambling, forgetting lyrics, mumbling, and I’m not sure what Manson’s issues were, all I can tell you is that his performance came off lazy, uninspired & it’s sad to see him fall from grace this way. 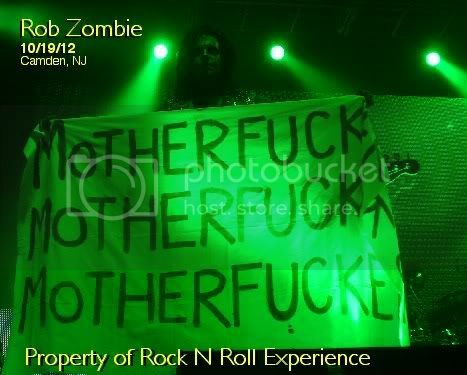 “Coma White” was probably the only moment of the set where Manson managed to sound decent & he pulled off a semi decent performance...the rest of the show was hit or miss & I’d say it was mostly miss simply because he kept screwing up song after song and it came off really unprofessional. The theatrics were there but for the most part it was the same old stuff...the large DRUGS sign for “Dope Show”, the snow for “Coma White”, the “mOBSCENE” signs for “mOBSCENE”, the podium for “Anti Christ Superstar” & the show itself was more like a sloppy Vegas performance gone wrong than a tight, top notch rock show. 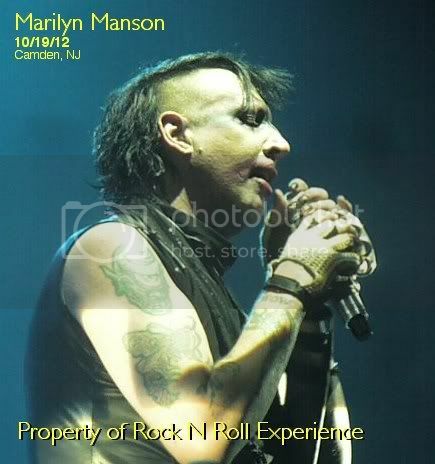 The Manson set was standard for this tour, the only surprise to the set was “King Kill 33” which I’d never seen the band perform live before and for what it’s worth the rhythm section is the only thing that really holds the current version of Marilyn Manson together at this point because Twiggy’s guitar playing was weak & about 50% of the time there’s backing tracks that fill in the guitar parts & the solos so at any given time the bass & drums are the only live instruments being played live onstage but that’s not to say that Twiggy doesn’t play live onstage because he does, he just doesn’t play that well when you compare him to John 5! 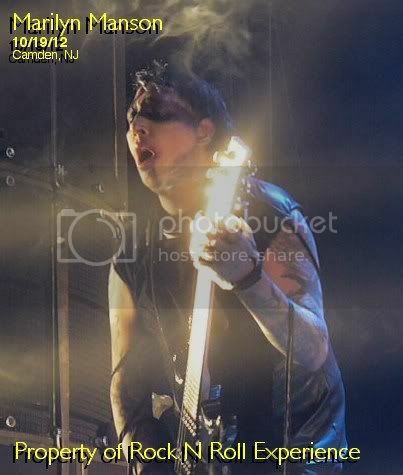 The Manson mess ended with “Beautiful People” & this was the most bland cover of that song I’ve ever seen the band play and I’ve seen Manson over 25 times in concert so I can compare good & bad performances from MM. 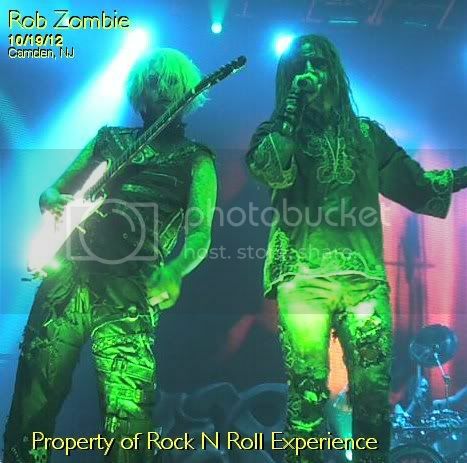 Rob Zombie WAS the headliner of the night & the first song of the set “Jesus Frankenstein” blew away Manson’s entire show & it’s simply because the Zombie band was spot on, they sounded good, they played as a band, they had a REAL guitar player & Zombie wasn’t all f**ked up & acting like a fat junkie onstage. 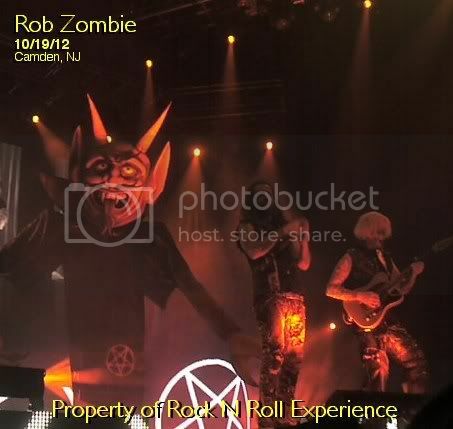 Zombie added a few new things to the show including a giant devil that came out during John’s guitar solo & after his solo they did a cover of “The Munsters” theme song which sounded pretty cool! 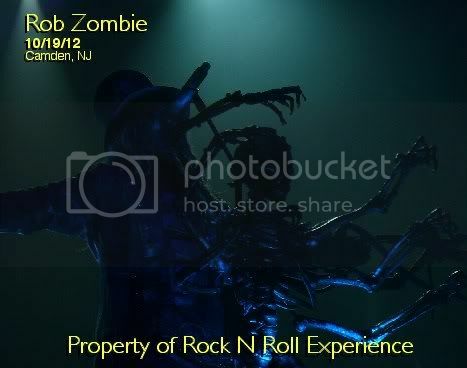 Zombie & his band interacted more with the crowd than MM’s band did and they gave a stronger performance which is what most people will remember from this night. 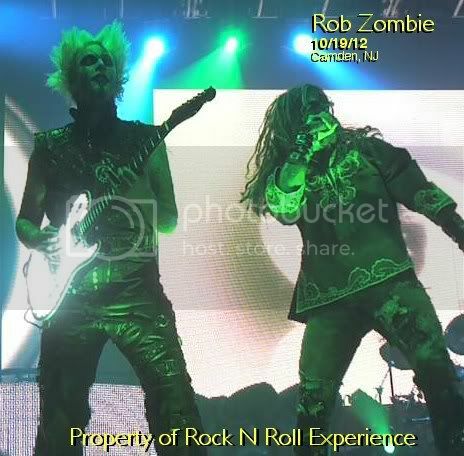 Zombie made Manson look like sh*t & the thing is, Manson made himself look bad because his performance was so lackluster & just plain bad! 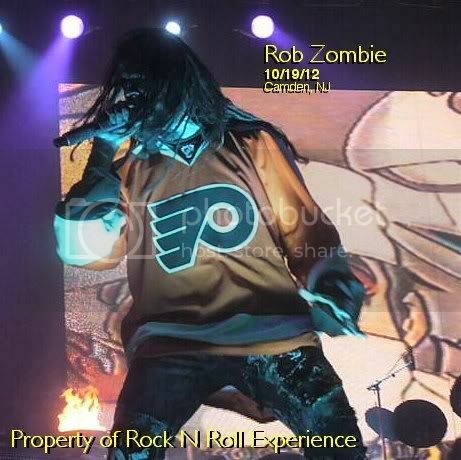 Zombie took the stage during “Never Gonna Stop” wearing a Flyers Jersey & he gave a small speech about how much he liked the Flyers but had to take the jersey off after one song because he it too hot onstage to wear a jersey. 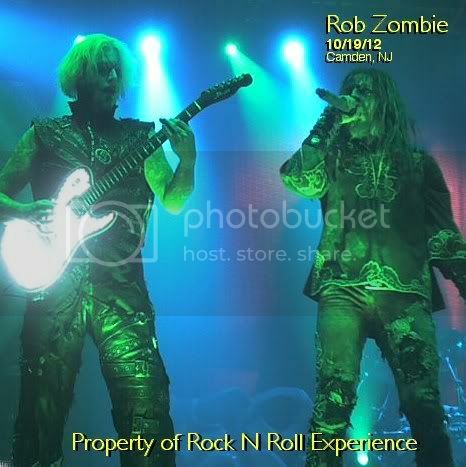 If you were close enough to the front you might have noticed former Murderdolls/Dope guitarist Acey Slade was in the pit taking pics and for what it’s worth, I did have a fun time at this show, it was a great Halloween show, I just wish Manson would get it together and stop delivering these horrible performances...the man is able to still give good shows when he puts the effort into it but sadly on this night Manson was simply phoning in his performance and it’s sad when an artist rips off his fans like that with a bad performance.